The AGS Laboratories is dedicated to the science of diamond performance. To that end, our research is ongoing, as we explore emerging technologies for diamond cutting and techniques designed to improve a diamond’s beauty. On these pages, you’ll find the best thinking and practices from our team of research experts. The illumination of light in a diamond impacts its beauty. The AGS Laboratories research team spent years of testing and retesting, uncovering all the factors at play in a diamond’s performance. 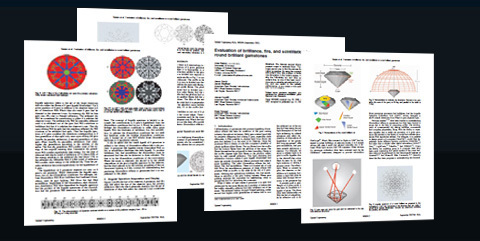 This report, “Evaluation of Brilliance, Fire, and Scintillation in Round Brilliant Gemstones” appeared in Optical Engineering, the flagship journal of The International Society of Optical Engineering.